Ocean Dunes in Highland Beach, Florida is a luxury waterfront condominium building offering residences a life in paradise. Standing 12 stories tall, with just 48 condos, Ocean Dunes provides its residents a more intimate style of living. Each 3-bedroom residence offers exquisite views of the Atlantic Ocean or Intracoastal Waterway. The sight of the white sandy beaches and sparkling water can be seen from each condo’s private balcony or floor to ceiling windows, among the other upgrades featured in each unit. Each residence is between 2,100 and 2,300 square feet and features granite countertops, glamorous kitchens, marble flooring, spacious floor plans, crown molding, and walk-in closets. Ocean Dunes condo building in Highland Beach is located just between two major cities in South Florida, Delray Beach and Boca Raton. Residents are a short drive away from the Downtown Delray Beach Atlantic Ave where dozens of high-end boutiques and night-time entertainment is featured or they can drive to the Town Center Mall at Boca Raton as well as enjoy the famed Mizner Park. Ocean Dunes is also situated between two international airports and is within close distance to all major highways. Living at Ocean Dunes is luxury, oceanfront living at its finest. 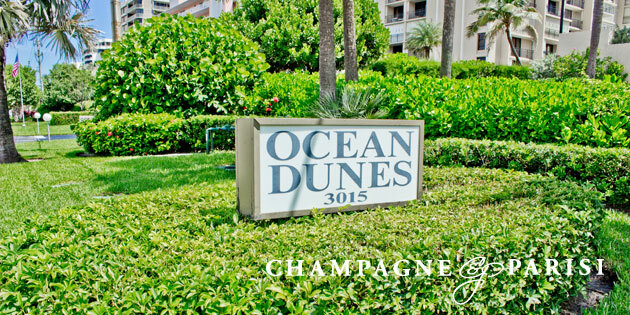 Residents who choose Ocean Dunes are on vacation every day of their lives.